I must tell you about some new ideas I have been thinking about. I really took a lot from doing the 30 day prompt during December, and blogging every day. Stepping into the process was a real revelation for me. I knew I had to show up, in some way, every day. It was the beginning of forming a new habit. I would switch off as many distractions as possible, sit down in front of my screen and show up. I would even announce to myself, okay I'm here! This is me showing up. To whatever is there. Something will happen. Even when you are feeling unsettled or it feels difficult. I started to follow a thread, that weaved it's way in and out of my life and my day. It became easier, it became something that I do. It became part of my day. And the beginning of a new way was formed. I want to see if I can apply this to other areas of my life. What can do for 30 days that will create a change in my life? Two big areas for me are wanting to go forwards with my craft business and needing to make stretching/yoga part of my day. I'm think it may be best to begin with one thing, so that the process of that one thing really has the possibility to come alive and be heard everyday. It will slowly find it's way into your awareness and start to speak to you. Take up a space, or find a way to! I have chosen two, I am a little concerned. They both feel important. I think keeping one as the main focus could be wiser. I'll let you know if it does feel like too much. I don't want it to be an overload of 'shoulds'. So I've put the word 'gentle' above both ideas. It's a gentle beginning. A 30 day stretch and a 30 day craftathon. It may mean five minutes of stretching fitted here and there or an hour of stretching out on the mat. It may mean crocheting a few rows or creating a new listing on etsy, or just sitting at my craft table and giving myself the space to think about what I want to do. It's a gentle picking up of the thread and starting to follow it. See where it leads. I think the point is if I can show up to it, it can begin to happen. You may have to show up feeling tired or not in the mood. But show up anyway. I think you will be surprised. There's so many things I could think of doing this with. Even simple things, like 30 days of noticing the people around you more. 30 days of connecting more, in some small way, everyday. 30 days of walking a mile. 30 days of journaling or drawing. So many things. Would you like to join me? Does anything spring to mind? Make a little card and put it up. Mark off the days in your diary. Give yourself stars! So 30 days. Start today, start now. In some small way. Remember go gently. 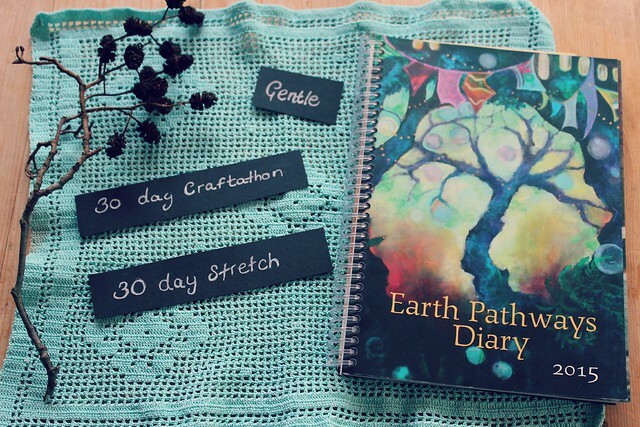 You can read more about the Earthpathways diary here. A great way to start a new year. Wishing you every success. A 30 day change, I really like that idea. Because it just makes it a step that is easier to take. "One step at a time" type thing. Because if we expect too much from ourselves, we do sometimes set ourselves up for failure. You are so good at crafts, I love the heart that you sent me last Christmas, so beautiful. You have such talent. Proceeding with your craft career can only do well! Happy New Year Heather, I hope this year is happy, prosperous and healthy for you. I love this idea. I think the gentle part is critical to its success, no one needs yet another task master. Recently I have given my self permission to read a little every day( usually on the train to work) and to crochet a small amount in the evening. If I do these small things I feel so much more complete and not just some one who works, cooks and cleans. I hope 2015 is a positive craft year for you. What a gentle, encouraging way to start this fresh, new year! I will let this thought germinate in my mind today and see what happens. I love the brightness of your blog; it is in harmony with 2015 which, to me, sounds like a number which bears light. I just love it when I get inpiration from sweet blogging people! yes, it seems that you have balanced really well, the goals and the gentleness on yourself. open and flexible to how long or what exactly each will entail. i'm not a goal-maker myself, but i do have one overarching intention - Connections. I did this during 2014 - one thing each month - it really worked! Good luck and happy NY!